Belitung Island is not only about beautiful beaches. If you look for something calm and refreshing, there are many waterfalls in that island. For instance, there is Jurak Insum Kepala Kawai. 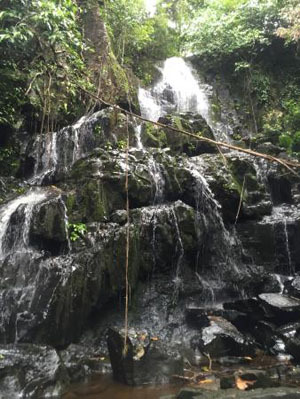 This gorgeous waterfall is located in Simpang Rusa Village. If you want to enjoy it, you only need to visit Membalong District. The height is about 15 meters. It is situated on the hill, so you need to conduct small trekking in order to reach the location. In a nutshell, it is going to be a great adventure! The most noticeable thing about Jurak Insum Kepala Kawai is the swift water. It is both pure and fresh. The water falls from the hill above. Below, it features many rocks and stones. Near to the falls, you can find several types of trees. Both sides of the waterfall feature rocky terrains. If you are a rock climber, Kepala Kawai would definitely become a challenging location for rock climbing. During the rainy season, this location is quite cold. It is better to come in summer, so you can enjoy the breezy atmosphere and nice weather. The most popular activity in Jurak Insum Kepala Kawai is trekking. Before reaching the fall, you must pass through several nature spots. This is going to be a worthy experience. No wonder, most of the visitors are nature lovers. If you are lucky, you may encounter Gapabel. It is a community of nature lovers in Belitung. They are quite strict, though. For instance, they will scold you for littering. That means you should protect the environment while exploring the waterfall. Apart from trekking, there are other famous activities. These include camping and photography. Camping is rare, though. Only local people love such activity. For foreigners, camping can be quite troublesome. Why is that? It takes much time to prepare the equipment. Another popular activity is rock climbing. In the left part of the fall, you can find a majestic stone boulder. Rock climbers definitely love to come here. For beginners, it is better to be safe. The stone can be glistening sometimes. Jurak Insum Kepala Kawai holds an interesting history. In the past, it was a hideout of lanun or robbers. Lanun hid on the top of the waterfall. There is an area called Babak Tenang. It features plain terrain so robbers could hide in it safely. Dare you to climb it? Overall, the waterfall is quite interesting to visit. Once you enjoy good times in that fall, you must visit Simpang Rusa Village. The villagers have some good foods, so you must try them. Your first destination is definitely Simpang Rusa Village. Usually, tourists come from Tanjung Pandan. You can take either a motorcycle or a car. The distance is 36 km, so it takes about an hour. As for accommodations, Membalong District doesn’t have many options. Thus, you must have had your room in Tanjung Pandan or nearby regions prior to visiting Kepala Kawai Waterfall.